Over the centuries, the Lithuanian Jewish community has acquired the identity of Litvaks, which is closely related to Lithuania. Lithuania has become a whole world for the Jewish artists – a mother, home, manuscript of wisdom, talisman, solace, cracked land, the place of tragic losses... They embraced Lithuania with love, nostalgia and poetic melancholy. 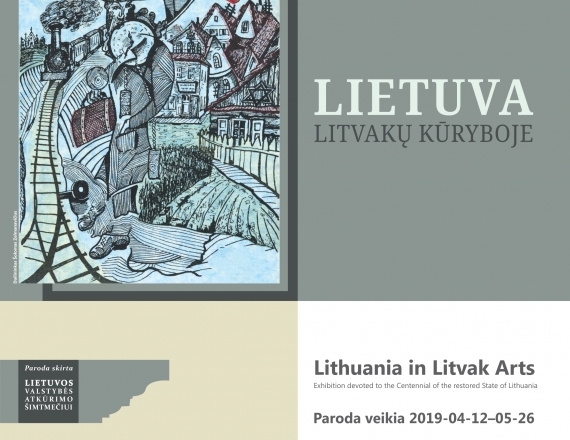 The exhibition focuses on the most important aspects of creative works of Litvak artists, that reveal the most popular Lithuanian images in painting, graphics, poetry, novels, songs, music, cinema, and theatre. Some artists were concerned with the romanticized views of historic Vilnius, others – with a native town or a traditional Lithuanian landscape, or with shabby quarters of labourers, ruins of cities or Lithuania “on the other side of the barbed fence”. Poetry enthusiasts will be delighted with the poems translated from the Yiddish language about Vilnius and Lithuania, including a unique work – a poem by a famous painter Marc Chagall about the Great Synagogue of Vilnius. The lovers of history, music, art, cinema and theatre will discover many interesting facts in the exhibition. The exhibition also traces the search for Litvak identity in a multicultural world, which manifests in a variety of ways, starting with memories of native places and writing in the Lithuanian language, and ending with the change of surname into Litay (in the Hebrew language – Lithuanian) after returning to the homeland. The exhibition was prepared using visual and documentary material from museums, archives and private collections of Lithuania, Poland, Germany, Italy, Israel, Russia, the USA, and Uruguay. In the exhibition the visitors will be able to watch two unique, however, forgotten films: 1) the silent film Vilniaus legenda, created in 1924 by the Polish film company, which was sounded in 1933, and whose storyline was told by Vilnius citizen Joseph Bulov, who in that time was a successful actor in New York; 2) the first coloured Lithuanian feature film-pamphlet Marš, marš, tra-ta-ta!, created by the director Raimundas Vabalas, filmed in 1964 in Lithuanian Film Studio, and whose political satire was not understood and appreciated by the viewers of that time. The exhibition is accompanied by an audio guide specially designed for visually impaired visitors, it presents the comprehensive content of the exhibition. The voices of Audrius Čaikauskas, Regina Jokubauskaitė and Virgilijus Kubilius invite visitors to immerse themselves in the fragments of Lithuanian Jewish history, listen to poems translated from Yiddish to Lithuanian and to visualize the analysed art works. Young visitors of the exhibition will be able to spend time while playing with magnetic puzzles and to create Lithuanian landscape or the images of Lithuanian town.